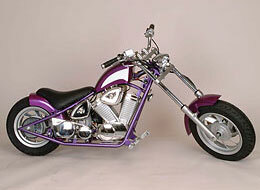 New 2005 Model, choose from 3 mini chopper colors. Fuel/ Oil Gas & 2 Stroke Oil @ 25 : 1 (unleaded) Range 25 MI. Wheel Base 50" Ground Clearance 4.5"
The Mini Chopper III motorbike is another added innovation to the Pocket Bike and Gas Scooter family. This hot new item is suitable for young teens and adults of all ages. 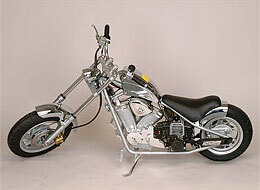 The Chopper III is equipped with a 49cc air cool motor . Other features include a custom tailpipe exhaust, front headlight, front disc brake with rear drum for smooth braking , and an awesome body of steel. 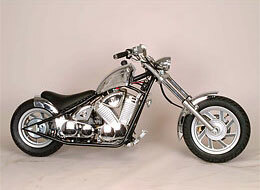 Its motorcycle style solid steel frame is designed with a superior solid frame and fine welding, giving the Chopper III a high quality finish. This Harley style Mini Choppers have a driving range to about 25 miles with a top speed of 25-30 miles per hour (depending on weather condition and rider's weight). 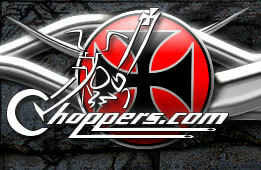 NOTE: It is your responsibility to make sure that your mini choppers are legal in your area BEFORE you buy online. This applies to electric scooter, gas scooter, and pocket bike purchases. If you buy your vehicle online and then find out later that it is illegal, you cannot return the product. Thank you for understanding that this is the policy we must have in the face of changing electric scooter laws and gas powered vehicle laws across 50 states.